Each week for 52 weeks, I’m sharing a different way you can save $100 this year. If you do all of these things, you’ll be able to save over $5,000 this year alone! Many of these things will likely be things you’re already doing, but hopefully all of you will pick up at least a few new ideas or some inspiration from this series. We use a lot of beans around here; they’re inexpensive, they’re filling, and they’re nutritious. Pair them with rice and you have a complete protein. I use beans to stretch our taco meat and as a base for many soups and other dishes we regularly eat. If you purchase dry beans in bulk, they are even more economical! When I read Ruth’s post here on how to live on beans and rice for a week, I thought it’d be fun to try and come up with my own version. 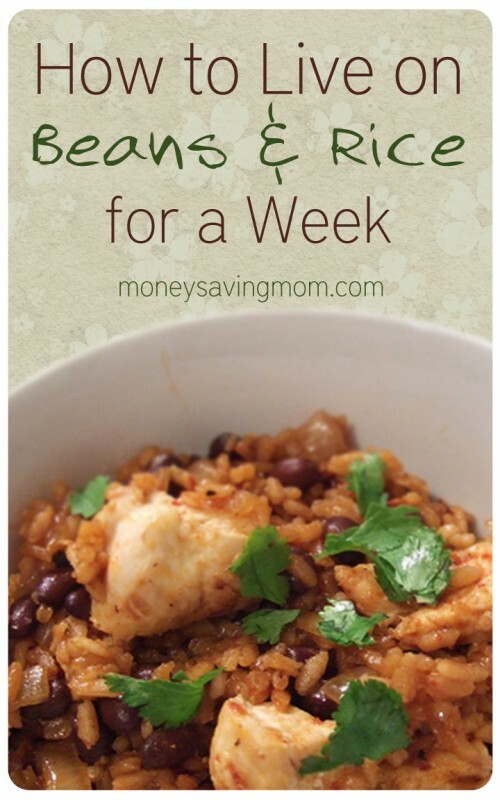 While we’ve never tried to just have beans and rice all week long, Ruth inspired me to come up with an almost-week-long beans and rice menu plan, too, using some of our favorite legume recipes. Day One: Cook up a big ole’ pot of beans (I do mine like this. You can add in seasonings, onions, etc. if you prefer). I’d recommend cooking black beans, pinto beans, and chili beans. Mix equal parts of the beans and make chili (we like to add onions, diced tomatoes, tomato juice, spices, hot sauce, pickle juice, and anything else that strikes my fancy that evening! You can add some browned ground beef if you like.). Serve over brown rice with cheese and hot sauce. Day Two: Take the leftover chili and make “haystacks”–set out bowls of chopped lettuce, tomatoes, corn chips, rice, cheese, sour cream, olives, and hot sauce. Let everyone pile things on and make up their own “haystack”. Day Three: Mash up some of the black beans and pinto beans (you can make them refried like this, if you like) and mix with a little salsa and chopped chicken. Roll up in tortillas, sprinkle with cheese and heat through. Day Four: Make pizza crust and top with mashed/refried beans, salsa or diced tomatoes, onions (if you like) and cheese. Bake. If you have leftover lettuce and tomatoes from Day Two, you could sprinkle them on top of the baked pizza. If you have any leftover chili, you could also make “Chili Pizza” using chili and tomatoes and cheese as the pizza topping. Does someone in your family hate beans? 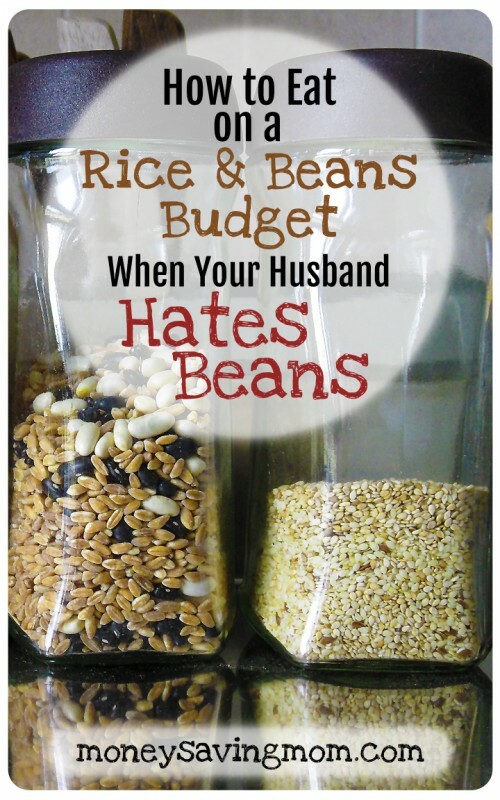 Check out this post from Kelly on how to eat on a beans and rice budget when your husband hates beans. Did you know that could be done? I didn’t, until I read an article in Gluten Free Living Magazine about preparing beans. I have greatly modified their recipe to due a much larger quantity, and have modified cook times. It is not terribly labor intensive, but spans a pretty long period of time while you’re doing other things, so pick a day you’ll be home for a few hours. 1. Find a big pot. I use an enormous soup pot. Bring 9 quarts of water to a boil. Do not add salt; it keeps the beans from softening. Rinse six cups of beans in cold water. After the water has reached a boil, add the beans. Boil at a rolling boil for about 3 minutes. 2. Remove from the heat and let the beans soak for an hour. 3. Return to the heat and bring to a simmer. Simmer until the beans are soft. It took mine about 2 hours (they were small black beans). Many things can affect how long it takes, including the type, the size, and the age. Older beans tend to take longer to soften. 4. When they are soft enough, package in 2-cup containers (that is the approximate size of a can, so it’s recipe -ready!) You can add some salt now if you want to, and leave them in their liquid. Now, next time you have a recipe that calls for beans, you can easily thaw out a container from your freezer, at a fraction of the cost. I ended up paying about $0.80 for 6 cups of dried black beans at the discount store (you could do any kind, though). I got six pints of beans out of this recipe, which equals about $0.13 per “can”. What are your favorite ways to serve beans? I’d love to hear! OK, I would love to know where to buy dry beans other than pinto beans. I have found those at Sam’s club and do make my own refried beans! But where do you find dry black beans or dry chili beans? Thank you!! Trina, I don’t know what state you live in but we have Harps Food Store here where you can buy in bulk. If you have a health food store in your area you might want to check there. They should also have it in bulk. Hope you can find some! You should be able to find them at most grocery stores. I have also bought them at Target, Sprouts (in bulk), and the 99 cent store. You might check the Hispanic food section or near the rice. I usually find them packaged like rice. Wal Mart has a good selection and they come in the Great Value brand which is cheaper. Costco will sell black beans depending on the makeup of your area. Also, I buy my beans routinely through the Church of Jesus Christ of Latter day Saints (aka the Mormons). They sell them super cheap and canned in the #10 cans, which will store until I want to make a batch. Thank you all! I need to do some more looking! I really enjoyed this post! Thanks Crystal. You are so welcome! Thanks for your kind encouragement! Yes! I often freeze beans. So convenient! I often coarsely chop portobello mushrooms, boiled black beans, and a touch of parmesan cheese up and use this as a filler with bread crumbs in meatless dishes! If you have a pressure canner it is simple to can beans and then they are ready to use anytime. Here is the method for canning them. I put them in the pot to soak the night before and they are ready to go in the morning. Using a 2 pound bag of beans from Aldi, 8 pints of beans costs $2.29 plus the canning lids. My pints have more beans than a can, most likely nearly 2 cups. I have had mixed results cooking them on the stovetop. Then I tried doing it in the crock pot, and have had great results for years! 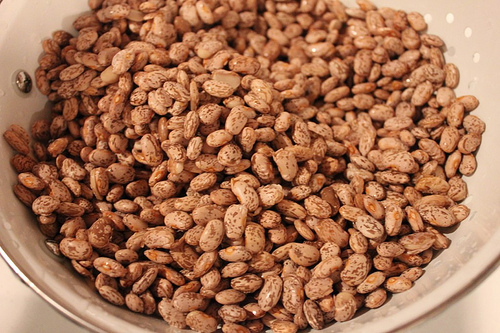 If you have time, soak beans for 1 or more hours and discard water. Otherwise go right to next step. Rinse beans (enough to fill the crock pot 1/4 to 1/3 full). 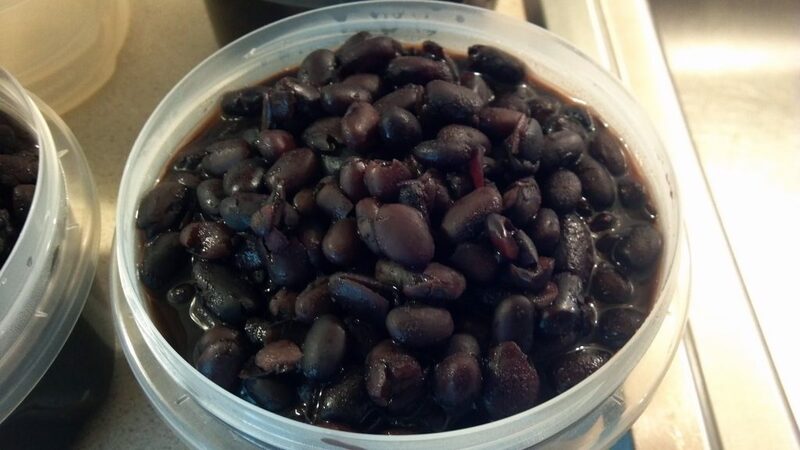 Put beans in crock pot, and add water to more than cover. I always cook mine in the crock pot too. I have never tried soaking them first. I just rinse, put them in with water and let it cook on low all day. I am surprised more people don’t cook them in the crock pot. It’s so much easier in my opinion! Caution: They do need to be boiled for a few minutes first though, for safety. Red kidney beans can be rather poisonous if not properly cooked. Thanks so much for sharing these tips! I needed this reminder to fix more beans, as I try to lower the grocery bill! I will say that beans always cooked unevenly and split for me when I cooked them on the stovetop. I found success with the crockpot. So try different methods to see what works for you! I soak them overnight, rinse them in a colander, then cover with water in the crockpot, and cook on low for about 6 hours. And I add salt! It goes against what everyone says, but my beans cook great now! I once got a package of pintos with a seasoning mix in the bag. It said to cook it with the seasoning, which included salt. Guess what? They cooked just fine. So now I always put salt in. They cook nice and even for me. My typical way to serve beans is tex-mex style. Either pintos or black served with plain or mexican rice. Top with any or all: salsa, sour cream, cheese, tomatoes, cilantro. Yum! 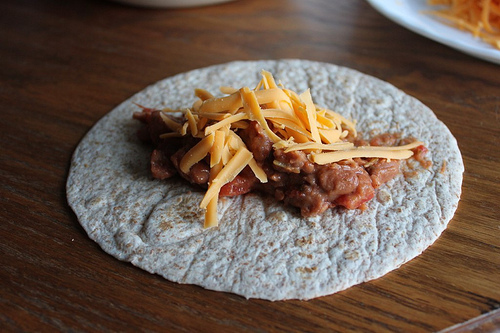 I always blend up some of my leftover pintos for bean and cheese tacos. It freezes nicely in plastic freezer jars, too. Yep, you can definitely add salt before cooking. Even without adding salt, my beans were always gritty, even when cooked all day. Tried the Crock Pot and they weren’t cooked after a day! (I’ve come to believe that Crock Pot runs cool.) To replicate the silky texture of canned beans, I brine mine before cooking per Cooks Illustrated. They’re so good that we eat lots of dried beans now! Just had some black bean and corn salad with Chipotle’s honey lime dressing! I remember a Walgreen’s ad that had a spinach pizza recipe using white beans pureed with garlic as the base instead of pizza sauce. Then I added spinach, tomatoes, & cheese as the toppings. It was soooo good. I need to see if I can find the recipe again. If you find that recipe, I’d love to try it. It sounds delicious! ½ c shredded, reduced-fat Colby Jack cheese. 1. Preheat oven to 425°. Pour enough boiling water over dried tomatoes to cover; let stand 10 min. Drain. Cut into thin strips; set aside. 2. Place beans & garlic in food processor. Cover & process until smooth. Spread beans over pizza crust. Sprinkle with oregano, tomatoes, spinach, & cheese. Place on ungreased cookie sheet. 3. Bake about 10 min or until cheese is melted. I used homemade pizza crust, fresh tomatoes (maybe sliced Roma tomatoes), & frozen (thawed & drained) spinach. I may have used mozzarella cheese. I did not pre-bake the crust. I think I baked it longer, but don’t know how long. I’ll just have to wash it when I make it next time or go by a homemade crust recipe. I love using dried beans. I used to fix them on top of the stove, like my grandmas, with big chunks of ham, lots of salt and pepper and a carrot. We always had fried potatoes and cornbread baked in an iron skillet. Yum! I always froze the left overs and they were always just as good if not better. Then one day I was making chilli and didn’t have enough canned beans. I found pinto beans in the pantry, rinsed them and put them in the crock pot. I added my chilli seasoning, water and an onion and let it cook about 5 hours on high. Browned my ground beef and added it and tomatoes and cooked old hours. That was the best chilli I’d ever made! I froze the left overs and now if we want chilli, burritos, taco salad or chilli dogs the base is already done. I agree with the others the crock pot is the easiest. Yes! I freeze beans all the time! Only it’s just for me and the kids because I also fall into the “my husband hates beans” camp. Thanks for the post. I enjoy using beans in my cooking whenever possible to increase protein. Feeling adventurous, I have even added pureed (unsalted) white beans to smoothies and quick breads such as banana and date-nut. They don’t change the flavor of the breads at all, though you do have to enjoy a hearty smoothie to try it. =) There are plenty of recipes out there for hiding beans in your food. Theres, that’s genius to add them to banana bread! I’m curious do you decrease the flour or oil? Thanks so much! I can’t take credit for that idea. I simply searched for recipes online. There are many out there. This is the one I made: http://www.mommyskitchen.net/2010/05/versatility-of-beans-mini-white-bean.html It was very good. We eat beans in our household several times a week any and all types – two of my favorites are Black Bean salsa chili and tomato and white bean soup – (I can post the recipes here if anyone is interested) both can be made in the slow cooker or stove top, they are kid friendly and freeze well. I also add them to quinoa, in salads, blend for hummus and so many other ways, I literally have a section in my recipe book for beans – I’m vegetarian so beans are my staple for protein. I would love the recipes Rita! ng to incorporate more meatless meals into my diet. Thanks! I love beans, and my Muffin could eat them all day long. My husband is not so fond, though, especially of pintos. But I keep trying to convert him. The way I tell him is (as I have recommended that some people tell their husbands about leftovers): if you don’t like it, make something else (and help to plan out the menu for the week). We love beans around here. I cook them in the pressure cooker…way faster and no soaking needed. Once cooked I package them in two cups also. We don’t eat much meat around here…maybe a pound a month or so. I also make black bean brownies and garbanzo bean chocolate chip cookies. Beans are so versatile. 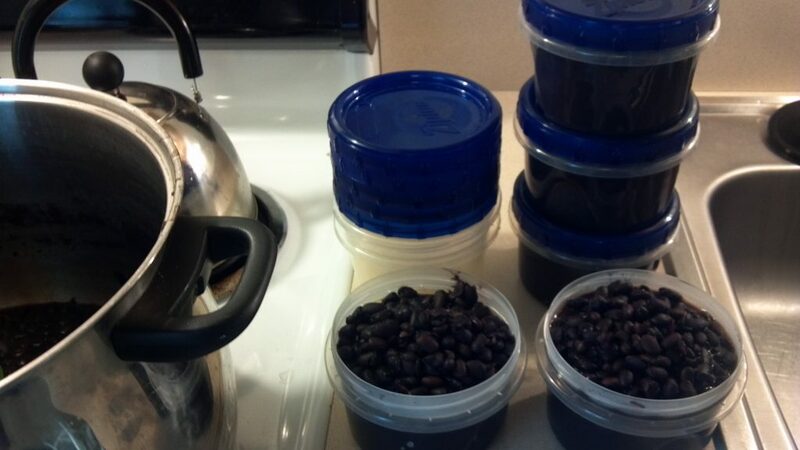 I love using my pressure cooker for beans. They don’t have to soak first, and they are ready to eat in under an hour (if the beans aren’t old, they are ready in about 40 minutes)! I have a new pressure cooker/canner, super safe, and easy to use. I know some people are afraid of them because of the old ones that had lids that could explode, but the newer ones have more safety features to prevent that. Can you give more information on cooking beans in a pressure cooker? Do you leave the bottom rack in? I’d love to know more about this. We like to do red beans and rice on Mondays, New Orleans-style with sliced sausage rounds and Creole seasoning. Yum. A story-My late MIL knew nothing about cooking and neither did her mother. My MIL was raised with servants and then married into a different lifestyle. My FIL loved a good bowl of navy beans and my MIL wanted to make them for him. She called her mother for advice. Her mother said that you had to cook the entire bag of beans because once opened they would go bad. My MIL did not know that they expanded when they cooked so she bought the biggest bag the store had. She started cooking them and had to keep moving them to bigger and more pots until she had all of their biggest pots on all 4 burners of the stove. Of course there were so many cooked beans that she ended up throwing them away because they would not fit in the tiny refrigerator that they had at the time. She loved to tell that story on herself and always wondered why she thought her mother would know the answers to her questions. We just recently started making our own refried beans and we LOVE them! I like to cook a big batch all at once, season and mash them, and then freeze them in meal size portions. When i first tried this, I used the crock pot, but then my crock pot does cook slower than some, and it took all day for them to finally get soft. The next time I made them, I needed more than would fit in my crock pot, so I decided to try the roaster oven. She does a lot of sweet (literally sweet) things with beans. They’re incredibly versatile. Thanks so much for mentioning her blog! I haven’t read all the comments so maybe someone has already said this but I use a crockpot to cook my beans. Doesn’t get any easier! Dump them in crockpot, rinse, pour off water, put enough water to cover them about an inch, add celery, garlic, onions, bell pepper and diced salt meat. Salt and pepper. Cook on medium or high. After they have cooked for a few hours, make sure there is enough water in the pot. About an hour before we eat, I mash 1/2 of them so they get thick. We like them soupy so you will have to judge the amount of liquid you need. Cheap, healthy and delicious. Burgers! Black bean burgers are the best, ever. I cook 1-2 lbs of dry black beans in my crock pot, mash them up with some cooked quinoa… and lots of spices, onion and garlic, and them bake them in the oven. One batch will make 1.5-2 dozen burgers and they freeze really well. Pair this with some kind of vegetable (sweet potato fries are my favorite ;-)), and you have a nutritious, fast, and affordable meal! One thing you can do for bean eating is to sprout lentils or mung beans and put them in stir fry. We eat a lot of beans. I buy them in bulk in 25 pound bags and pay around .65 a pound for them by buying them that way. I buy pintos, black beans, and white beans for that price. I pay more for kidney beans, lentils, and mung beans. White beans (navy beans or Great Northern/cannellini beans) are very mild and are great blended in soups. I freeze beans without liquid and then if I am making supper at the last minute with no plan, (who does that! :)) I can just plop them out of the plastic container and they thaw with the other ingredients that are simmering on the stove top. I can’t say enough good things about beans. I have raised my family on them. They fill the belly, are nutritious and tasty and have antioxidants. I buy them in bulk and it really saves our family money. This is such a fabulous resource! I’m a huge fan of all things beans and thought I had all recipe bases covered … turns out, nope! Thanks for the excellent new suggestions. I especially love Theres’ comment about sneaking them into banana bread. So clever! I love to cook my beans in the oven. I use a old blue roaster put the oven on low and let them cook all nite. I check and add water b4 going to bed. I always add onions and spices. they are great the next day.